Christmas is coming Sew What Are You Waiting For? Have you been thinking about buying my How to Make Doll Clothes Video Course but just haven’t gotten around to it yet! Well, now’s the perfect time because with Christmas just around the corner, I’m feeling very jolly and have decided to start giving out my Christmas gifts a little early. Firstly, if you’re a Cabbage Patch Doll lover and would love to purchase my How to Make Doll Clothes video course but receive the bonus patterns in the 18 ½” CPK doll clothes patterns size instead of the 18” doll clothes patterns size, then NOW you can! Simply email me after completing the checkout process and let me know so that I can arrange that for you. If you order the DVD set, you will still receive the CD with the 18” doll clothes patterns but I will then set you up with 12 months online membership so that you can access the 18 ½” CPK bonus patterns online! Secondly, I’m sure you’ve already heard what awesome value my How to Make Doll Clothes video course is with over 130 instructional videos and 8 free doll clothes patterns…well now it’s even better value! Yes, from now until midnight on the 24th December, 2013 when you purchase my How to Make Doll Clothes video course I’m giving away an additional pattern of your choice absolutely free! 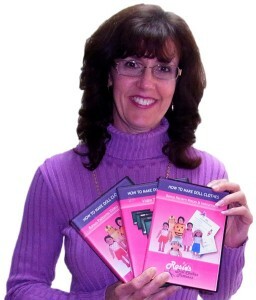 So whether you choose to do the online course for $49.94 or purchase the DVD set for $69.94 you will receive a total of 9 Free doll clothes patterns. That’s up to $57.55 worth of doll clothes patterns absolutely free! And as always, you also get to choose whether you do the course…. OR you can purchase the DVD set so that you can do the course now at your own pace and then pass the DVDs onto your children or grandchildren when they are ready to learn how to sew. It doesn’t get any better than that. ‘Sew’ with Christmas coming, what are you waiting for? 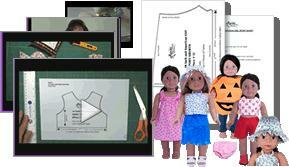 click here to purchase my How to Make Doll Clothes video course now.